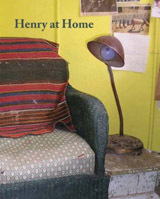 Henry at Home presents photographs of objects from Henry—a shop in Hudson, NY, run by Nancy Shaver—as they appear in the homes of the people who purchased them. In addition to these photographs, taken by the objects’ new owners, Henry at Home includes artwork by Nancy Shaver, an introduction by Lucy Raven, and an interview between Shaver and Steel Stillman. Nancy Shaver‘s work has been shown extensively in solo and group exhibitions for over forty years, at venues including Curt Marcus Gallery (NYC), Feature, Inc., (NYC); Michael Kohn Gallery (LA); Galerie Montenay (Paris). Shaver’s work is included in such collections as the Museum of Contemporary Art, Los Angeles; Douglas S. Cramer Foundation; Chase Manhattan Bank;and Progressive Corporation. Shaver is the recipient of grants and fellowships from the Pollock-Krasner Foundation, Yaddo, the MacDowell Colony, and Anonymous Was A Woman. In 2010, Shaver was awarded a Guggenheim Foundation Fellowship. In addition to running her shop, Henry, Shaver is a co-director of Incident Report, an experimental viewing station for visual projects, also located in Hudson, NY. Shaver teaches in the Bard College MFA Sculpture Department.